A new AEG BMT12C 12V Multitool has been spotted over at the AEG France Facebook page. What’s interesting about this multitool is that it’s a stand alone tool meaning it’s not part of the Jobmax head system with interchangeable heads and handles. 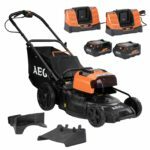 The new AEG BMT12C 12V Multitool has a compact design thanks to it being a 12v tool. Thank goodness it has a tool-less blade change system as many others like Bosch and Makita are still producing 12V multitools that require the use of hex keys to replace blades. 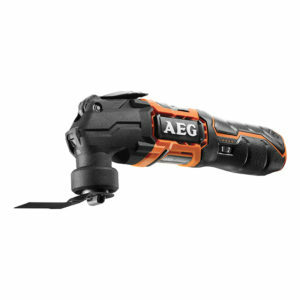 The AEG BMT12C 12V Multitool uses a traditional latch and pin system for easy blade changes. It would have been nice if they had opted for the Starlock mount which is the best mount in my opinion but the tried and true latch and pin system is good enough for now. As far as other features go, it has the usual slide lock power switch with a variable speed dial which I prefer over the Jobmax trigger by a long mile and it comes with a LED light up in front so I find the AEG BMT12C 12V Multitool to have a nice feature set. 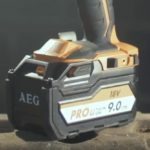 Hopefully this becomes a Ridgid branded tool at some point but I do not know if we will get this here in the USA as a Ridgid but many AEG tools as of late do so we have hope. Big thanks to Joshua B. for spotting this. With a speed of up to 20,000 rpm, you can efficiently customize the tool for workspace and application. 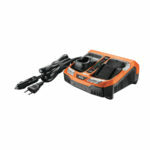 With its universal adapter, the tool is compatible with all accessories on the market.